Father’s Day is coming up so soon! Every year I like to think of a new and fun idea to show Matt how much we appreciate him. Flowers don’t work (except rosemary on steak) and ties get old quick. 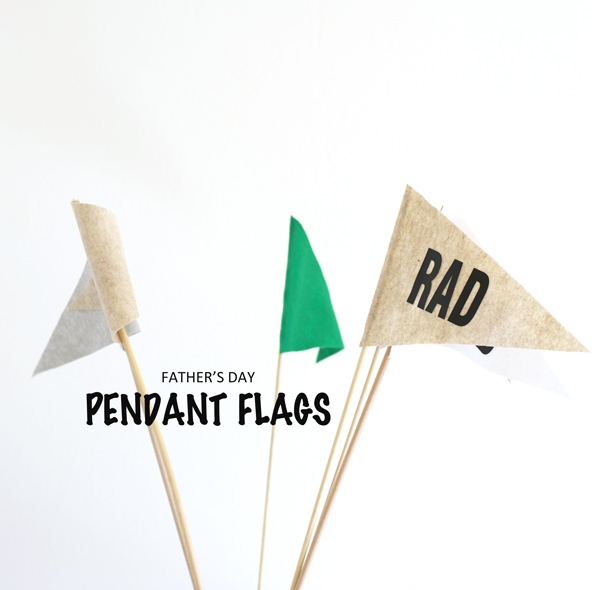 This year we’ve been crafting a bouquet of Father’s Day pendant flags. 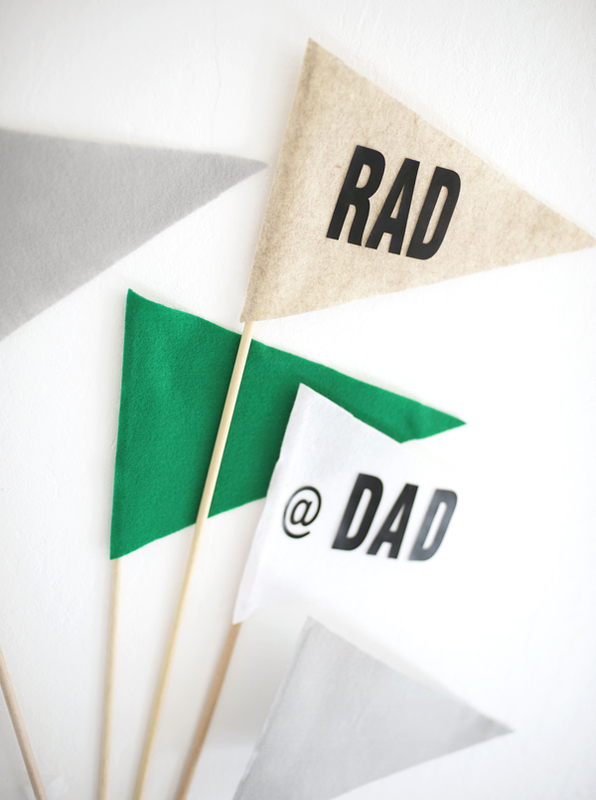 They are a fun way to say “We think you’re rad dad”, and when dropped off at the office he will instantly feel that dozen-of-roses-at-the-desk feeling. He will literally well up with pride. If we are going to cheer on anyone, shouldn’t dad be the one? 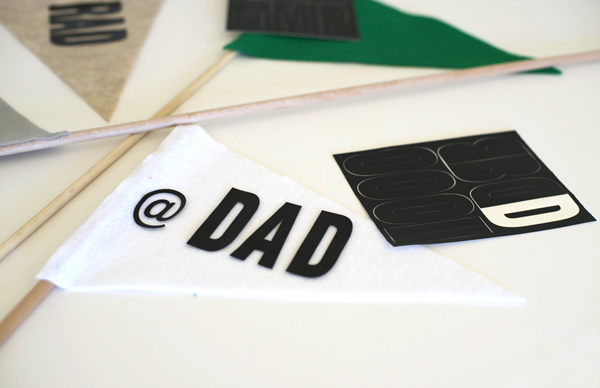 To make the Father’s Day pendant flags; you’ll need felt, wooden dowels and adhesive letters. 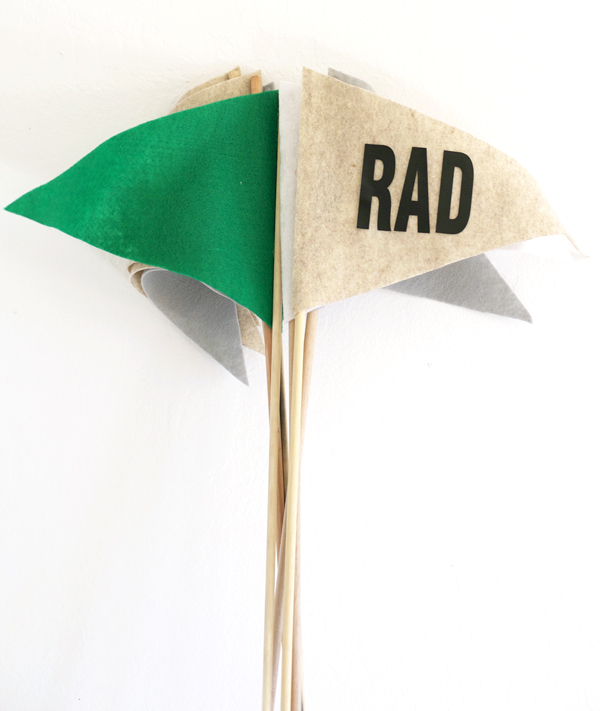 Start by cutting out 8×10 pieces felt into a pendant shapes (a triangle vertically on the felt). Attach the pendants to wooden dowel sticks with hot glue and allow to dry. 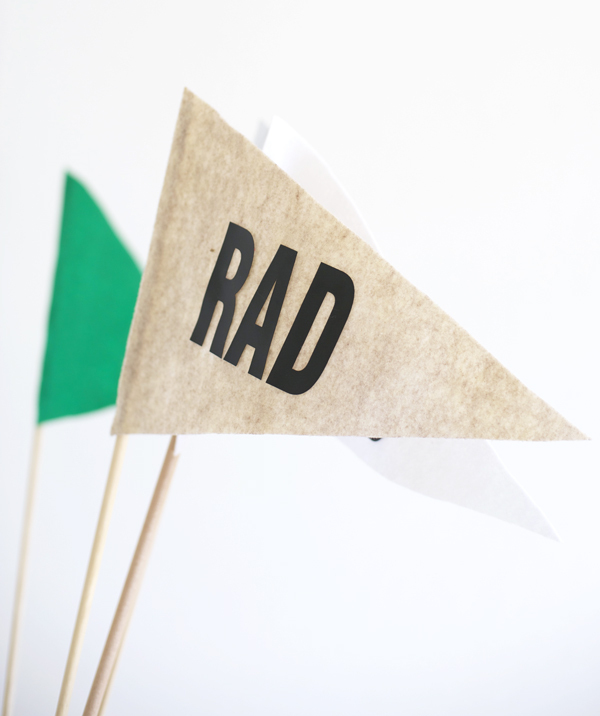 To make the wording for the flags we used adhesive stick on letters. They can be found at home improvement stores and are made for boat siding. I was so happy thy had an @ on the package we purchased:) Think up words and phrases that will make dad feel loved -peel and stick. It’s that simple! Drop of this manly bouquet of awesomeness at his desk, house, or favorite resturant. Since I often get stuck thinking of Father’s Day ideas, I start with a basic search online to find inspiration. 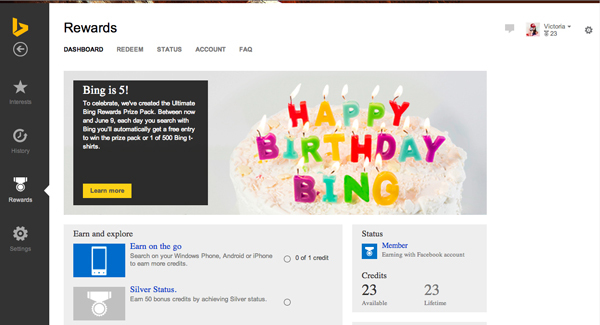 When Bing asked if I wanted to try out the new rewards program , it was a great reason to start searching. I wrote in Father’s Day ideas and found a ton of creative options. I really liked the search options and was happy to be able to search specific categories, like blogs. With the new rewards program – it is even better. 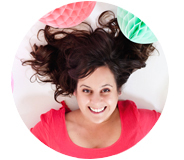 I am earning points every time I search, that I can use towards gift cards at stores we love. 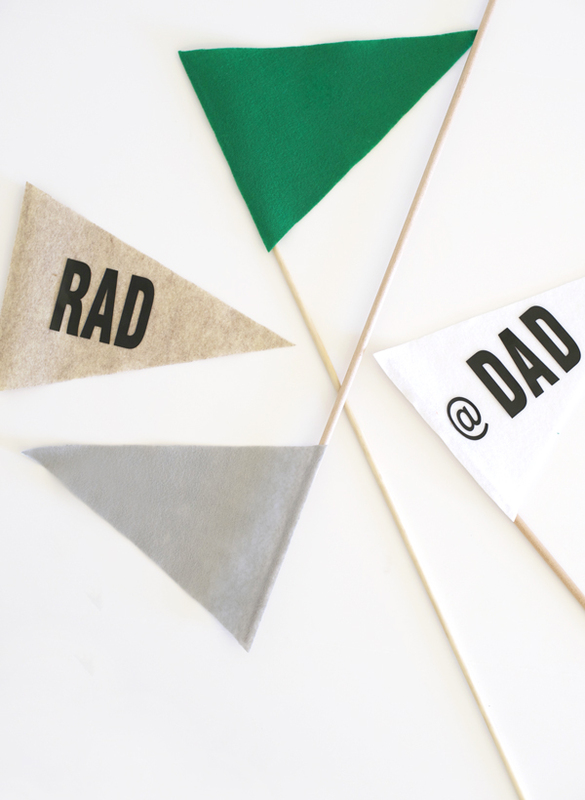 So dad’s flag pendants can come with a gift card to his favorite restaurant. Good since chicken wings and hugs are all he really wants anyway. I’m required to disclose a sponsored partnership between our site and Bing. I have been compensated in exchange for this post in the form of payment, product or experiences. I’m required to disclose a sponsored partnership between our site and Bing. I have been compensated in exchange for this post in the form of payment, product or experiences.